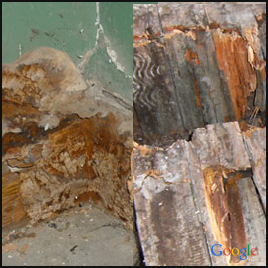 Wet rot is the natural decaying of wood where a high level of dampness is present. It is a general expression used to define wood rot caused by an assortment of fungal species. The most common type of fungi causing wet rot is Cellar Fungus. Any wooden item exposed to extreme moisture can act as the ultimate breeding base for wet rot micro-organisms. Additionally, wet rot can occur for a number of reasons such as leaky roofing, broken pipes, improper drainage, etc. In short, if wooden items are subjected to excessive damp for longer periods of time, the outcome shall generally be some type of wet rot. Dry rot, on the other hand, is wood decay occurred in the absence of damp, usually caused by some fungus species that consume parts of wood that give strength and rigidity to the wood. We offer comprehensive wet rot and dry rot solutions in order to minimise its disruption and damage, at very reasonable cost. Get in touch with us and let us show you how.